The CleanFinancial.com guide to spread betting on Rio Tinto shares. Where to Trade Rio Tinto Shares for Free? Where to Practice Trading Rio Tinto Shares? How to Spread Bet on Rio Tinto? You may also be able to take a view on Rio Tinto with other spread trading providers. Where Can I Find Live Prices and Charts for Rio Tinto? This interactive CFD trading chart will provide users with a helpful overview of the Rio Tinto share price. The chart above is from Plus 500 and typically uses the Rio Tinto futures market (not the daily market). Should you want to analyse financial spread betting prices and charts for Rio Tinto, you will normally need a financial spread betting account. Also, a spreads account lets you trade on daily contracts. Readers should note that opening any such account is normally dependent on credit, status and suitability checks. Should your new account be accepted then, when you log in, you will be able to study the charts and the current pricing. These are usually provided as part of the service. Having said that, you are likely to receive the occasional sales email and/or call from your chosen online spread betting company. If you do decide to trade then, before starting, you should note that financial spread trading and CFDs do involve a high degree of risk to your capital and you may lose more than your initial investment. See below for more on advanced Rio Tinto charts. The UK shares are above the 20 day MA of 3537.2p and above the 50 day MA of 3554.6p. Price data from Google Finance. Also see Live RIO.L Share Price & Charts and About Rio Tinto for more information. With brokers raising their price targets for Rio Tinto, Johnson Matthey and TUI Travel, IG's David Madden considers some of the reasons why these stocks are in focus. The mining company has seen some major moves in the share price as Chinese demand and commodity price fluctuations impact sentiment. Despite the concerns, the dividend has continued to grow, with brokers remaining bullish of the stock and the outlook remaining fairly strong. Following a move by Glencore during the summer to seek a merger with Rio Tinto, Evan Lucas, Market Strategist, questions the potenital value and looks at why the board may have rejected it. A large range of intervals e.g. 1 minute, 15 minutes, 1 day etc. Key overlays e.g. Parabolic SAR, Ichimoku Clouds, Envelopes etc. Secondary indicator charts e.g. Momentum Percentage, Williams %R, Accumulation Distribution etc. Advert: Rio Tinto Spread Betting, sponsored by FinancialSpreads.com. You can spread bet on Rio Tinto with Financial Spreads. Where Can I Spread Bet on Rio Tinto for Free? Speculating does involve risks. Having said that, if you'd like to open a free Demo Account, which lets you access trading charts and try out spread betting, please see below for more details. In addition, spread betting, in the UK, is exempt from capital gains tax, income tax and stamp duty*. The above spread betting firms currently offer a Test Account that allows investors to test new trading strategies, gain experience with a range of orders and check charts, including line and candlestick charts. If you are looking to speculate on firms such as Rio Tinto then one solution could be to place a spread bet on the Rio Tinto share price. When making a spread bet on FTSE 350 equities you trade in £x per penny. As a result, should you choose to invest £4 per penny and the Rio Tinto share price changes by 33p then there would be a difference to your bottom line of £132. £4 per penny x 33p = £132. This is a Rolling Daily Market which means that unlike a normal spread betting futures market, there is no closing date. If you leave your position open at the end of the day, it will stay open and roll over into the next trading session. Then you may buy a spread bet at 3172.0p and risk, for the sake of argument, £2 per penny. So, you win £2 for every penny that the Rio Tinto shares increase and go above 3172.0p. Nevertheless, such a bet also means that you will lose £2 for every penny that the Rio Tinto market decreases lower than 3172.0p. Put another way, should you buy a spread bet then your profits (or losses) are calculated by taking the difference between the closing price of the market and the initial price you bought the spread at. You then multiply that difference in price by the stake. Financial spread betting doesn't always work out as you would have liked. In this example, you wanted the share price to rise. However, it could fall. If the Rio Tinto shares had started to fall then you might choose to close your position to limit your losses. Note - Rio Tinto Rolling Daily spread correct as of 17-Oct-12. 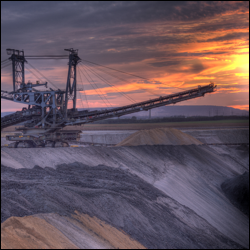 Below we have an older, but still useful, case study on the mining company by Shai Heffetz, InterTrader, 2-Nov-2011. Rio Tinto is of course one of the world’s largest mining companies and one of the largest FTSE 100 companies. It mines a large variety of metals and minerals, including diamonds, gold, silver, and iron ore. If we look at the chart below, we see that Rio Tinto is currently trading at the same price it was trading at roughly three months ago at the beginning of August 2011. Between then and the end of September, it was mainly downhill for the share. It stayed below the 28-day SMA for most of the time and, on the few occasions on which it did venture above the average, it turned around and headed south again almost immediately. At the beginning of October, we saw a reversal of fortunes for the share. 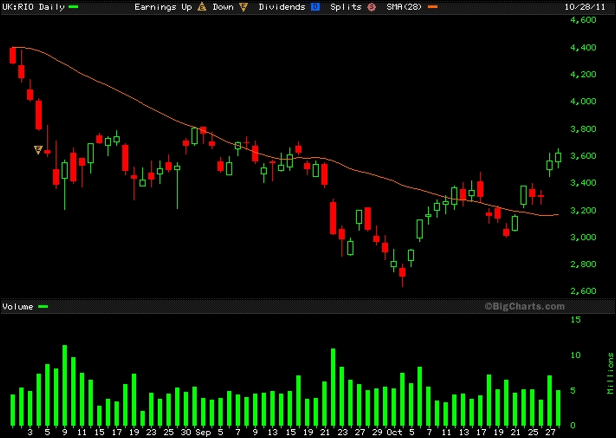 We had a number of up days in a row, causing the share price to break through the 28-day SMA. After that, we saw a negative price correction during which the price dropped below the SMA again, but it soon recovered. During the last week, it has broken through the 28-day SMA once again and the last two trading days saw a particularly strong effort by the bulls to push the price upwards. Technical analysis would suggest that we are definitely in the middle of a short-term bull run. We have seen a new short term high and the SMA has also started levelling out. Before rushing into a long trade however, keep in mind that on a yearly basis the stock has still seen a negative return of 8.6% on the shares spread betting markets. We will probably soon see a dip in the price when traders start to take profit. Once that is over and the price resumes its upwards movement, going long becomes an attractive option. 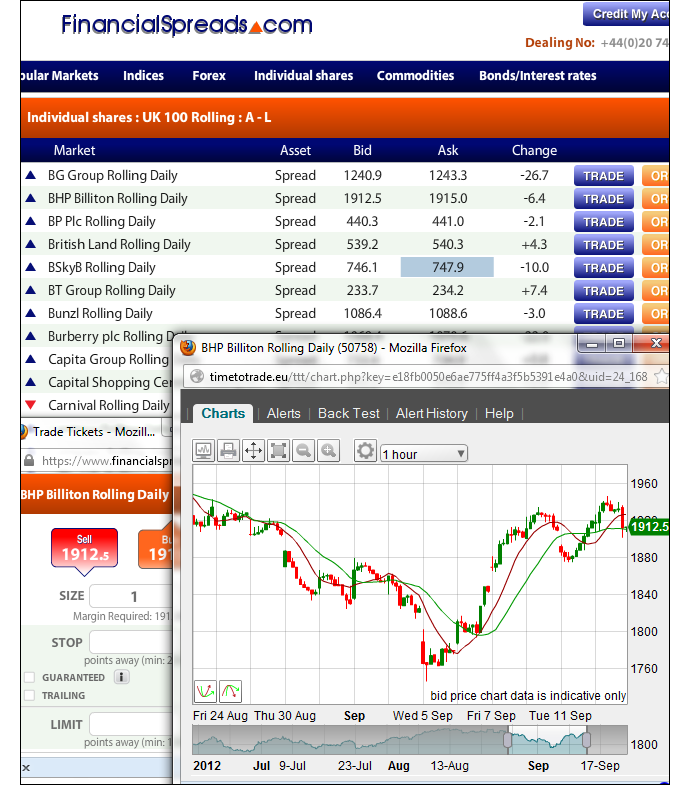 Rio Tinto spread betting and trading guide with live LON:RIO share prices and charts. Plus, daily updates, broker recommendations, where to spread bet on the UK shares tax-free* and commission-free, how to trade... » read from top.